Over the past 12 months, mobile attribution firm AppsFlyer analyzed 17 billion app installs across 7,000 apps worldwide. It found that the amount of install fraud roughly tripled. 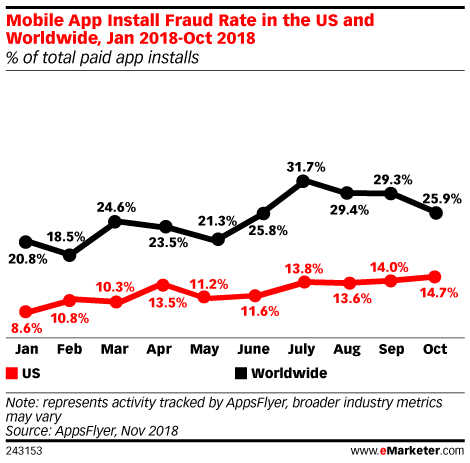 More than one-quarter of the installs that AppsFlyer analyzed in that timeframe were fraudulent. eMarketer estimates that $7.1 billion will be spent on mobile app install ads in 2018, up from $6.5 billion last year. App-install fraud refers to the practice where a company falsely gets credit for getting a user to download an app. Read the rest at eMarketer.